Enjoy uninterrupted sea views, beautifully appointed living spaces and easy access to an array of local amenities and attractions at Villa Bella Vista. 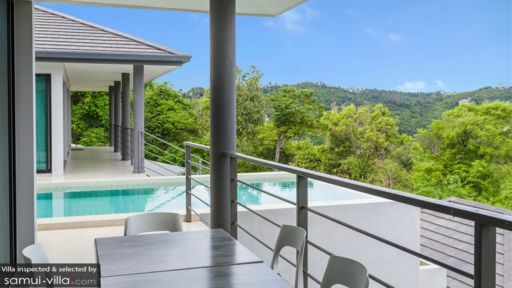 This vacation rental comes with all the fittings and services you’d expect of a luxury property - from impeccable service to a full range of modern amenities. 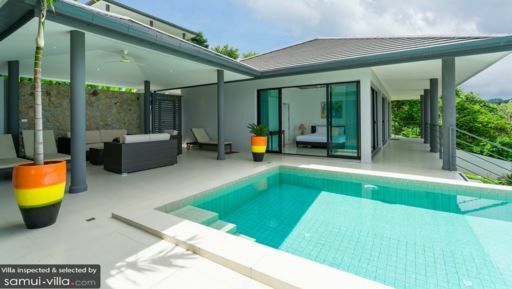 Located in Bophut, the villa is just a six-minute drive from the beach, and the town’s restaurants and bars offer a relaxed, laidback setting that’s just right for a night out with friends and family. All three bedrooms facilitate rest and relaxation with amenities like pillowy king beds, air conditioners, ceiling fans, quality linen, spacious balconies and private en suites. The decor is kept simple with an all-white interior, modern furnishings, paintings and decorative bedside lamps - so your eyes are drawn out the full-length glass doors towards the villa’s picture-perfect surroundings. Jump right into the rectangular infinity pool for a dip! Both the pool and outdoor seating area look out to the villa’s incredible surroundings - a landscape made up of dense forestry, rugged coastlines and the ocean. After a quick swim, dry off against a soft towel before relaxing in the shaded sala, which comes outfitted with a couch, armchairs and daybed. A dining set in the terrace lets you enjoy meals in a breezy, al fresco setting. All common areas and bedrooms at Villa Bella Vista are spread out across a single storey. Full-length glass sliding doors flank the walls to offer easy access to the pool, as well as to let sunlight cascade in to brighten up the interior. The decor is sleek and stylish with all-white walls and flooring, neutral colours, minimal decorations and contemporary furnishings. Villa Bella Vista’s common area feels spacious thanks to the open layout, and features an indoor lounge that extends out seamlessly towards an open concept kitchen and dining area. Car hire and bike rental can be arranged at the property. The villa manager can assist with arrangements for a car and private driver, as well as for a cook for meals if required. Enjoy easy access to local amenities like Big C Supercenter and Tesco Lotus, both of which are located a five to 10-minute ride from your villa. Got last-minute plans for dining out? Hop on a car for a five-minute ride, and you’ll be right at the door steps of the colourful Karma Sutra Restaurant. Bophut Beach, located a six-minute drive from your villa is where you’ll spend your days relaxing lazily by the beach. In the evenings, stroll over to Fisherman’s Village to explore its eclectic array of restaurants, shops and bars. Unlike the party hubs of Chaweng and Lamai, the area boasts a family-friendly vibe, so you’ll feel right at home spending quality time with your little ones. Looking to fill up your travel itinerary? Big Buddha, Lamai city center, the Hin Ta and Hin Yai Rocks, Wat Bang Rak and Wat Plai Laem are attractions that come with our recommendations. 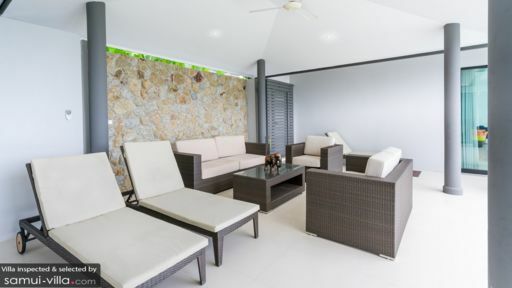 These points of interest are located a 15 to 35-minute drive away, and if required, your villa manager will readily assist with transport arrangements. Beautiful, indeed, a breathtaking view ..... Very nice house, close to Fisher man, so very well located, very functional with totally independent rooms.